Born in Boulder Colorado and raised in the desert by wild wolves I finally moved to Arkansas when I grew out of my puphood. I'm influenced by such diverse genres as punk, metal and R&B but starting to swing toward R&B. I write Gospel, Jazz, Ballads, and humorous songs. My primary instrument lately has been the twelve string guitar but most people know me as a bassist. I played with The Midgets and Agression in Denver and with Hairy Larry and The Flying Hungarians and Aaron Love and His TV band here in Arkansas. 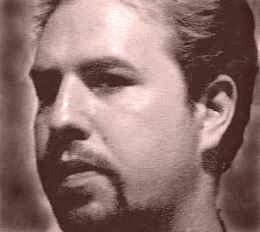 I was an Art student at ASU and do artwork for CD and Cassette covers and inserts. I also do some producing and studio work. Recently I did a single for Melissa Chedister called "The Good" and I also did some session work with Willie Lee Riley, Sweet Water Groove, and John Weston. My work is featured on "Something Blue" and you can hear some of it by clicking on the Estonia Music link below. I was audio enginer at Blues Fest 95 and a videographer in 97. I am actively involved in The Bandshell Project and on the staff of Delta Boogie. To hear Uldis Heyl audio clips check out the Estonia Music Section. Netscape users press the shift key when you click on the song title or Netscape will try to display the Mp3 as text.